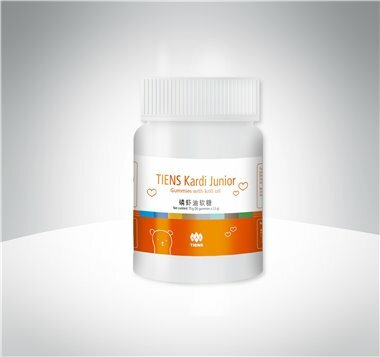 TIENS Kardi Junior is an ideal product for children. Tasty bear-shaped gummies with krill oil are a pure and natural source of Omega-3 fatty acids. Gummies with an orange and raspberry flavour are 100 % natural without any preservatives. It has a natural deep red colour from astaxanthin. DHA and EPA - two essential fatty acids in omega-3 oils, are crucial for children’s development. They provide important benefits including proper cognitive performance, brain and eyes development and a healthy heart. They take part in building new cells, keeping the membranes flexible and protective. TIENS Krill Oil is sourced from Antarctic krill which is the world’s purest source of marine Omega-3. To preserve the high quality of the krill, the gentle harvesting is immediately followed by careful processing. The uniqueness of krill oil is that the omega-3 fatty acids are provided in phospholipid form. Phospholipids form the structural basis of cell membranes in our body. Krill oil is easily recognized, incorporated and utilised by the body. Krill oil also contains a rich supply of astaxanthin which is one of nature’s most powerful antioxidants in the plant and animal world. Astaxanthin is also known for having an ability to crosse the blood-brain and blood-retina barrier, where it can play an important functional role. Chew 1-2 gummies per day. Not recommended for children who are allergic to seafood and the other ingredients of the preparation. Food supplement for children above 3 years old, providing a source of Omega-3 in convenient bear-shaped gummies. 100 % natural ingredients, colours and flavours. Recommended for pre-school and school-aged children, especially during this period of intense growth and mental development, physical activity and learning.